is the Reliable Poultry Supply’s Promise! Reliable Poultry Supply has the knowledge, the skills, and depth of experience to help you succeed. Our relationships with the leading manufacturers and the most successful growers provides us with a valuable perspective on the latest trends for poultry success. Whether you’re starting out, expanding, or upgrading, we can help your project. 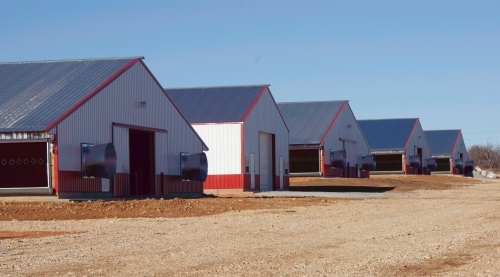 Most poultry producers rely on us and our selection of feeding and watering systems, lighting, heating and ventilation. Reliable Poultry Supply is a supplier of poultry producing solutions and leader in the poultry farm construction. Whether you are starting out, expanding, or upgrading, we can help with any project. Most poultry producers rely on us and our selection of poultry feeding, watering systems, lighting, heating and ventilation. We have the knowledge, the skills, and depth of experience to help you succeed. in Arkansas, Oklahoma and Missouri. QUADRATHERM® Heater. Reliable, efficient heat distribution with patented features with sturdy construction designed for easy cleaning and maintenance. Backed by more than 80 years of design experience. Chore-Time’s Energy-Efficient ENDURA® Fan could save 14% or more in energy costs! All ENDURA® Fan components were designed by Chore-Time to maximize overall fan efficiency. Chore-Time’s REVOLUTION® Feeder features a bird-friendly scalloped grill and a Rotary Feed Gate. The Rotary Feed Gate permits progressive adjustment of the feed level, even as the feeder is raised off the floor. RELIA-FLOW® drinkers are robust, precision-machined, stainless steel parts in flow-control area resist wear and retain their shape for long life and consistent, reliable flow. Sign up to receive poultry tips and discount coupons.